Shirts With Random Triangles: Georgia lands its first 2016 recruiting class members with commitments from QB Jacob Eaton and OT Ben Cleveland. Georgia lands its first 2016 recruiting class members with commitments from QB Jacob Eaton and OT Ben Cleveland. 2016 UGA commits Ben Cleveland and Jacob Eaton. Via Bulldawg Illustrated. Georgia's 2016 recruiting class is off to a running start the commitments of two blockbuster prospects. 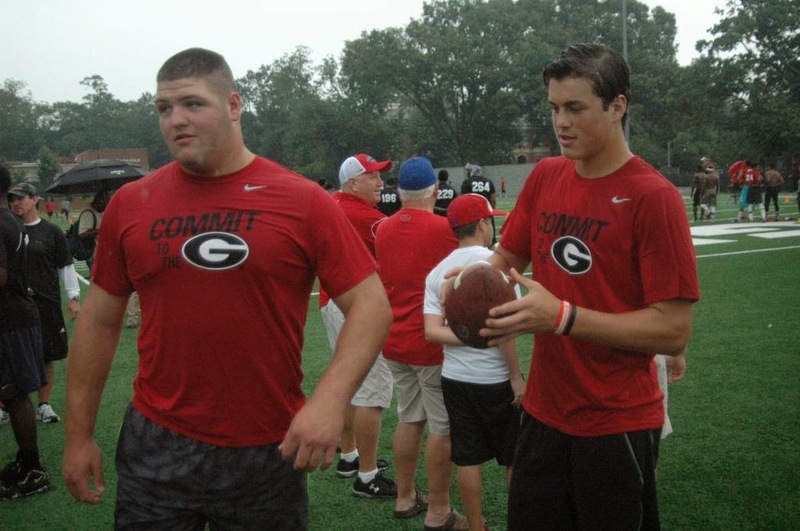 Two five-star prospects, high school rising juniors Jacob Eason (quarterback) of Lake Stevens, Wa., and Ben Cleveland (offensive tackle) of Toccoa, Ga., both committed over the weekend while attending Georgia's annual Dawg Night camp. Eason, announced his Georgia commitment to the world on Twitter Satruday night. Eason is ranked 4th in ESPN's Jr300, and is listed as the no. 1 JR pocket-passing QB in the country by the WWL. EPSN rates Eaton as a four-star QB. Eason's 247Sports.com intangibles are just as good. 247Sports.com rates Eaton as a five-star pro-style QB. He is ranked second among 2016 pro-style QB prospects. He's ranked as the top 2016 prospect in the state of Washington, and 14th among all 2016 prospects in the U.S.
Eason attends Lake Stevens High School in Lake Stevens, Wa. He stands 6'5", and weighs 205 pounds. In-state recruit Ben Cleveland also made his UGA commitment known on Twitter. Cleveland is rated as a five-star offensive tackle. He's ranked 3rd among OT prospects for 2016. He is ranked as the second-best 2016 prospect in the state of Georgia, and ranked 22nd among all 2016 prospects. Cleveland is ranked 44th in the ESPN Jr 300, which rates him as a four-star OT. The WWL also ranks Cleveland as the 5th-best OT among 2016 prospects at that position. Cleveland attends Stevens County High School in Toccoa, Ga. He stands 6'7", and weighs 322 pounds.